The best way to watch a Broadway-style musical with massive sets, elaborate costumes and special effects is – of course – in person. The next-best way? In front of a big screen in a theater. That’s the idea behind Sight & Sound’s MOSES, which was filmed before a live studio audience but will appear on the big screen in movie theaters across the country three nights (Sept. 13, 15 and 20), giving moviegoers who have never been to a Sight & Sound show – or who want to watch it again -- a chance to experience the colossal nature of a live production. 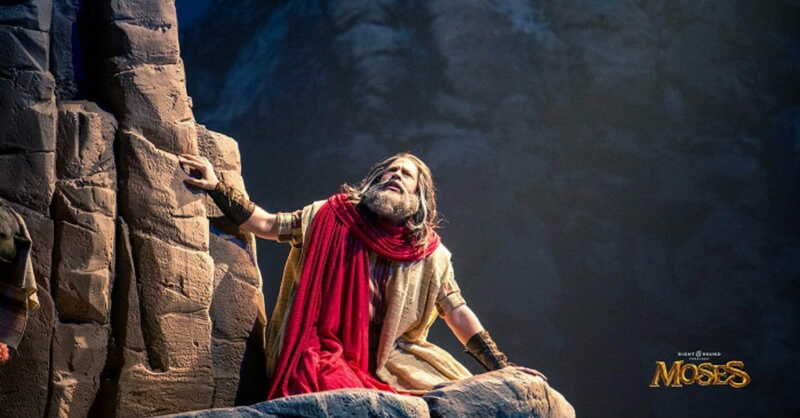 More than 1.5 million people travel to Sight & Sound’s two locations each year in Lancaster, Pa., and Branson, Mo., to watch the Bible come to life. Each wraparound stage is the width of a football field, and each production showcases a specific story from the Bible, complete with enough live animals to make the kids happy and enough special effects to leave mom and dad wondering: How’d they do that? More than 600 staff members are involved in a single production -- from writing it, to designing the sets and costumes, to acting in it. I’ve watched Sight & Sound shows in person and am impressed with the big-screen version of MOSES. It truly does capture one of the things that makes Sight & Sound shows so great: size. 1. It stays true to Scripture. It also includes lessons for our modern-day, postmodern audience. When Pharaoh presses Moses to worship the Egyptian gods, Moses refuses and stands firm: “I can only serve one god: the God of the Hebrews.” Earlier, when Moses’ mother sets baby Moses in the river – sparking a protest from Moses’ older sister – the mom says, “We’re not giving him to the soldiers. We’re giving him to God.” We then watch the basket float down the river – down a watery-looking aisle in the musical – before Moses’ mother says, “God is watching over you.” With themes of trusting God, following God’s will and standing firm on His Word, the movie has positive messages for the entire family. There’s a reason that more than 1.5 million people attend a Sight & Sound production each year. Sure, they want to be inspired, but they also know they’ll see things that will leave them in awe. Like the parting of the Red Sea, which literally takes place around the audience. Or the turning of the staff into a snake, which left me scratching my head, wondering how it was done. Or the flying of an angel over (seemingly) everyone in the audience. Or the plagues, from the gnats to the flies to the hail. Then there’s the musical numbers, which are every bit as powerful as anything out of Broadway.